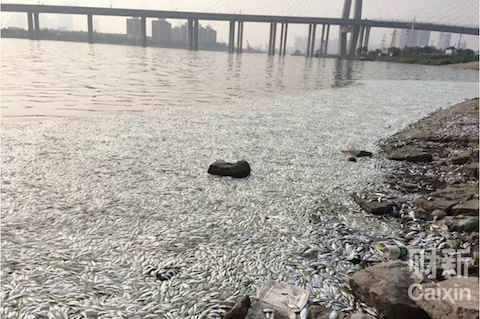 Boat loads of dead fish have washed up on the river shore, and a white foamy residue came down in the rain in northern China after a warehouse which held about 700 tons of sodium cyanide and other toxic chemicals exploded in an apocalyptic blaze last week. About 2,500 tons of toxic chemicals, including ammonium nitrate, potassium nitrate, and sodium cyanide, were in the exploded warehouse. Sodium cyanide, which is frequently used in gold mining operations, becomes highly toxic to animals and humans when it reacts with water and forms hydrogen cyanide. The cyanide levels in waters around the blast site in Tianjin’s Binhai district had risen to as much as 277 times the acceptable levels. But Chinese officials, who have been criticized for censoring information and mishandling one of China’s deadliest industrial disasters in the port city of Tianjin, say all is well. The city’s drinking water is safe, too, according to a report by the Tianjin Environmental Protection Bureau on Aug. 19. On Aug. 20, Tian Weiyong, the head of the environmental protection agency’s emergency department, said at a press conference that the Chinese authorities were cleaning up the contaminated water, which was mostly runoff used to fight the massive blaze on Aug. 12, before releasing it into the sewers. Tian added that the cyanide levels were normal in the water outside the immediate areas surrounding the blast zone. On Aug. 19, Chinese netizens posted pictures of dead fish floating up Haihe River, about 4.5 miles away from the blast site. Although a local radio station dismissed the netizen photos as “rumors,” other Chinese newspapers confirmed the phenomenon the next day—a photograph from Chinese business magazine Caixin show small, lifeless fish stretching out into the distance. Response from the Chinese authorities, while halting and slow in the first couple of days after the blast, was now near instantaneous. Tianjin Environmental Monitoring Center head Deng Xiaowen called a press conference at 4:00 p.m. on Aug. 20, and explained that it was “quite common” for large amounts of fish to die in the summer due to poor water quality, and promised to carry out “further investigations” and release the findings to the “common folk.” An hour and a half later, the Center announced that tests of the Haihe River water where the fish died showed no cyanide contamination, according to the state-run China Central Television (CCTV). Guo Hong, a professor of animal molecular breeding from Tianjin Agricultural University, told Legal Daily, a state-run newspaper, that there was no connection between the blast and the dead fish. “If both big and small fish die, then it is highly likely that their deaths are caused by contamination… What’s more, fish from a large area should have died, not only from that area,” Professor Guo said. “Could the death of so many fish have nothing to do with contamination from the explosion? Do we even need to clean up the contamination? And if the dead fish has nothing to do with the explosion, doesn’t that mean that we have a greater problem at hand?” wrote “runninglife” in the comments section of the CCTV story on the dead fish. 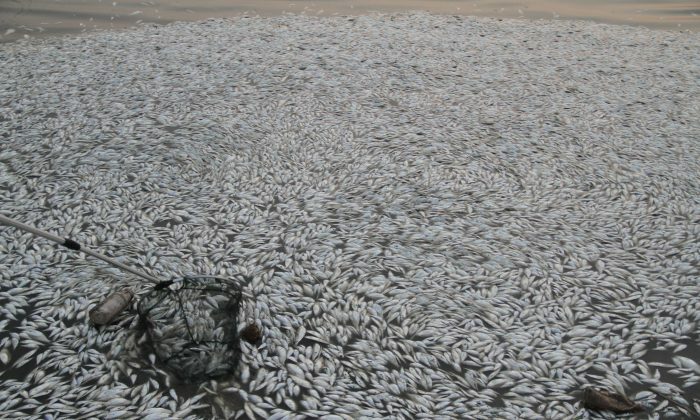 Cyanide is sometimes deliberately dispersed in water to aid fishing because it make fish sluggish—this practice is illegal in many places in the world, including the United States, according to Dzombak. Cyanide in water naturally degrades, either by the presence of bacteria or dissipation into the air if it sits on the surface. This can take “days or weeks, but not months and years,” Dzombak said.